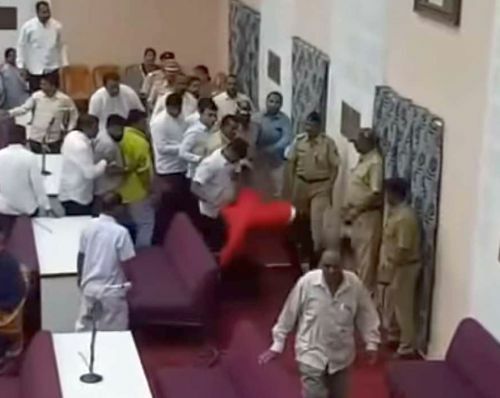 BJP corporators allegedly thrashed a Majlis-e-Ittehadul Muslimeen member today for opposing a resolution in the municipal corporation to pay tributes to former prime minister Atal Bihari Vajpayee. The alleged incident took place during the general body meeting of the civic body in Maharashtra's Aurangabad, an official said. After the meeting began, Bharatiya Janata Party corporator Raju Vaidya tabled a proposal to pay tributes to Vajpayee. MIM corporator Sayed Mateen opposed it, which infuriated the saffron party members, who allegedly rushed to him and thrashed him in the House. A video clip purportedly showing Mateen being kicked, punched and slapped by the BJP corporators has gone viral on the social media and was also aired by some TV channels. In the clip, the corporation security officials can be seen coming to Mateen's rescue and taking him out of the House through a side exit. The MIM corporator was later taken to a nearby hospital. A BJP corporator said Mateen had been creating nuisance and had also earlier opposed the singing of the national song in the House. Mateen told PTI that he was opposing the move to pay tribute to Vajpayee in a "democratic manner", but around a dozen BJP corporators assaulted him. He even named some of them. Immediately after the incident, alleged MIM supporters damaged a car belonging to a local BJP functionary and also beat up the driver. BJP corporator Pramod Rathod, who was named by Mateen as one of his assaulters, demanded that the MIM corporator be expelled from the civic body for his "anti-national" move in opposing a tribute to Vajpayee. Later in the evening, Vijay Sainath Autade, Deputy Mayor of the Aurangabad Municipal Corporation, lodged a complaint against Mateen at the City Chowk police station. The police said a case under sections 153A (promoting enmity between different groups on grounds of religion, race, place of birth, residence, language etc. and doing acts prejudicial to maintenance of harmony) and 294 (obscene acts in public) of the Indian Penal Code (IPC) was registered against Mateen.